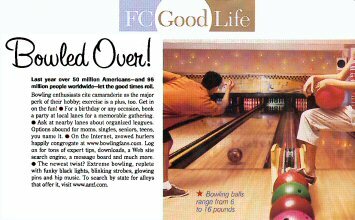 The October 15 issue of Family Circle (in supermarkets now) has a nice little story about bowling and even features BowlingFans.com. It is part of the FC Good Life column by Jonna Gallo and appears on page 26. Click the thumbnail above to see a scan of the entire article. Thanks for picking my site Jonna!